This residence’s grounds include a living, dining and kitchen area that open to the front and back of the property. A custom lift connects the three floors of the house, making it easy to access the entertaining and private rooms. The gourmet kitchen comes with a walk-in pantry and cold room, for all your cooking needs. Stainless steel bench tops and a beautiful stone island mark the kitchen’s interior design. The first floor of the residence features a media room located towards the back of the first level, a hidden study and a laundry room. On the second floor, four large bedrooms, three of which have their own bathrooms, leave the family feeling rested and comfortable. An extraordinary skyline of Brisbane can be enjoyed from the master bedroom’s deck. Placed on the middle of the second floor, a large entertaining area offers the inhabitants the possibility of relaxing and enjoying a beverage from the wet bar or wine fridge. A wine cellar and a four car garage with ample storage space complete this residence’s collection of spaces. Featuring a covered outdoor entertaining area complete with BBQ, wet bar, built-in plasma TV and access to the pool and outdoor shower, the villa’s outside space is dominated by modern design lines. 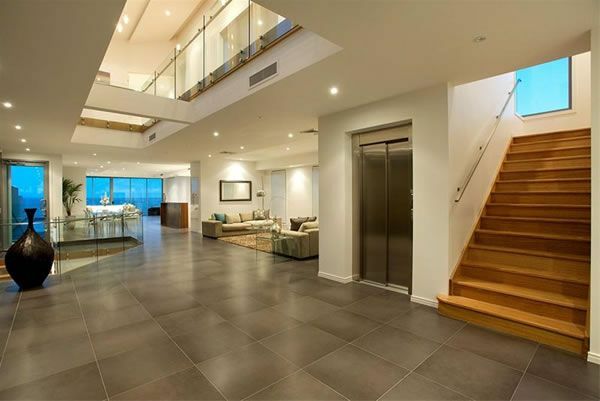 You will be happy to know that this Brisbane villa is on the market with Judy Goodger.